Been There, Done That: Are marketers neglecting the mobile app experience? When I was writing this past Thursday’s case study with Wattpad, a writing and storytelling platform with a large mobile audience, I began considering the ways that marketers are still underestimating mobile. 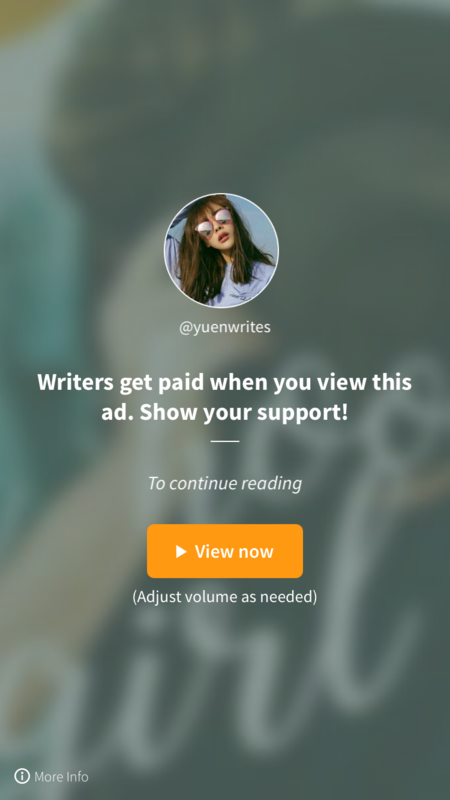 With Wattpad’s story, it seems almost heroic that they focused on community in the mobile ad experience instead of treating it like most others do — as an obligatory necessity that they just assume users will tolerate. Until, that is, you understand the dividends that focus paid, boosting in-app video completion rates by 98%. A MarketingSherpa Award’s Readers’ Choice nominee, Skyjet, also understood how profitable focusing on the mobile experience could be. The marketing team experienced a lot of disruption due to mobile marketing habits in the charter marketplace in Q4 of 2014, according to Jonathan Levey, Senior Digital Marketing Manager, Flexjet, and his company had to begin experimenting to keep up. Marketing 101: What is a hamburger menu? There are no dumb questions, only dumb marketers who don’t bother to ask. That’s why we’ve decided to begin publishing quick, snackable posts that will help you expertly navigate any project, no matter what team you’re working with. Today’s term is one you might encounter when working with your dev or design teams, and it has a particularly delicious moniker: the hamburger menu. “I think that mobile is one of the most profound changes we’ve seen in marketing in years,” John Costello, Global Marketing & Innovation, Dunkin’ Brands, Inc, said when I sat down with him in the MarketingSherpa Media Center at DMA’s event &THEN. ‘America Runs on Dunkin’ is more than just a slogan, he said. It really infiltrates every aspect of the brand to customer relationship. With mobile’s transition to becoming an essential part of consumers’ lives, Dunkin’ decided to put mobile front and center in its marketing strategies. That decision goes back to being customer-focused, John said. I’ve always felt that the aphorism about true wisdom being a byproduct of first admitting you don’t know everything to be accurate. We here at Sherpa have been preaching the shift in marketing budgets to mobile for years as well — just take a look back at this chart from last April. I don’t think there’s any argument on where the industry is going anymore. That being said, I do feel that some of the most convincing data about focus on mobile is being under-utilized by marketers, or even worse, it’s being used by marketers to justify decisions that are not in the best interest of their business — decisions that will not show the best ROI and could be spent more effectively in other channels. Working on partnerships in different industries over the past several years, I have seen both the good side and bad side of the mobile revolution, while making plenty of mistakes along the way. 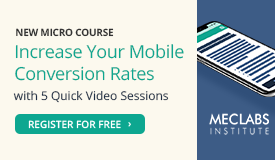 Seeing just how terrible mobile conversion rates can be compared to other channels is often disheartening. 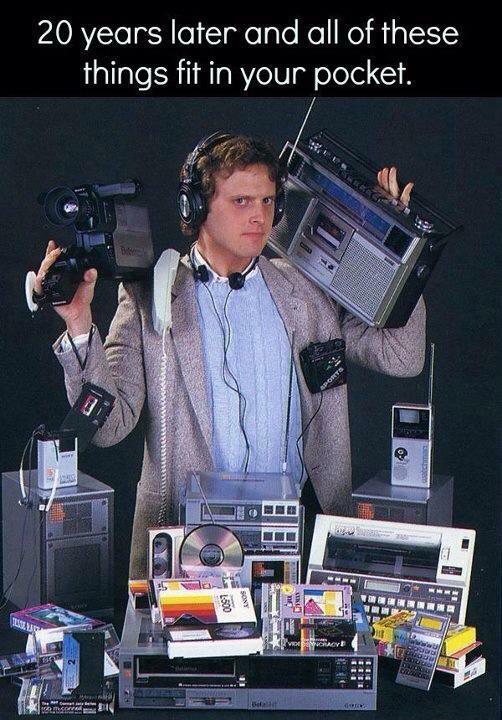 It’s not enough to just say “mobile is the future.” We need something more actionable. Marketers admitting as an industry that we don’t know everything is the first step. Seldom do I condone a selfie. Nothing makes me want to cut a slice of humble pie for someone more than a pointless, self-taken snapshot. If you’re doing absolutely nothing but think you look darn good, it’s pretty clear you’re pulling for some strokes to the ol’ ego. In the driver’s seat of your car? Not a photo op. Working at your computer but having a great hair day? Don’t click the cam. However, I do think there are some exceptions — and perhaps even necessary occasions — for a selfie. If I run into Jennifer Aniston on the street but no one’s there to take the pic, you best bet I’ll hold up my iPhone and do it on my own. While my iPhone’s photo album doesn’t have celebrity-accompanied shots (I’m working on it), it’s not selfie-free, which brings me to my other exception: fashion. Putting an outfit together or buying a piece of clothing is often stressful. I can look in the mirror as long as I want to see if I think a shirt looks funny or if my shoes go with my dress, but there’s nothing better than a second opinion. I can get that second opinion by taking a photo of myself in the outfit, texting it to my girlfriends to weigh in. What do you think of this top? How does this skirt look with these earrings? Should I buy it? All of my friends and I do this. 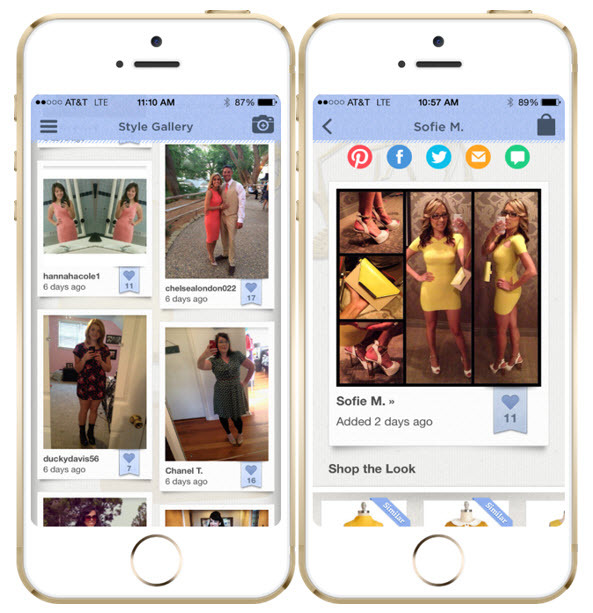 Fashion retailer ModCloth, a brand my wallet knows all too well, integrated this selfie behavior into its mobile app. I learned all about it when ModCloth’s Chief Technology Officer Udi Nir chatted with me in the MarketingSherpa Media Center at IRCE. Udi co-hosted an IRCE session in Chicago titled, “Mobile Commerce: Get Ready Today for Tomorrow,” where he gave me the scoop on ModCloth selfies along with how crucial it is to have a strong mobile presence. On the marketing side, mobile unlocks new opportunities for marketers to reach customers in ways and at times they couldn’t have before. ModCloth has channeled its mobile focus into its app, which has helped the company achieve both entertainment and engagement among its customers. One particular feature is the app’s Style Gallery, a place where ModCloth customers can upload their outfit photos to show how they’ve styled their clothing to give others inspiration, Udi explained. Here is a closer look at some research Manny shared. First, Manny discussed research from the MarketingSherpa 2012 Mobile Marketing Benchmark Report (Full discolosure: BlueHornet is the sponsor of this Benchmark Report, and was a sponsor at Email Summit 2013). 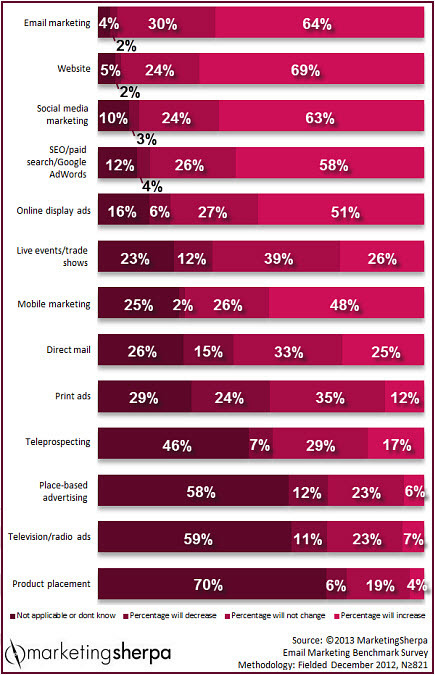 As you can see, increasing sales conversion/revenue is the top business objective for mobile marketing. 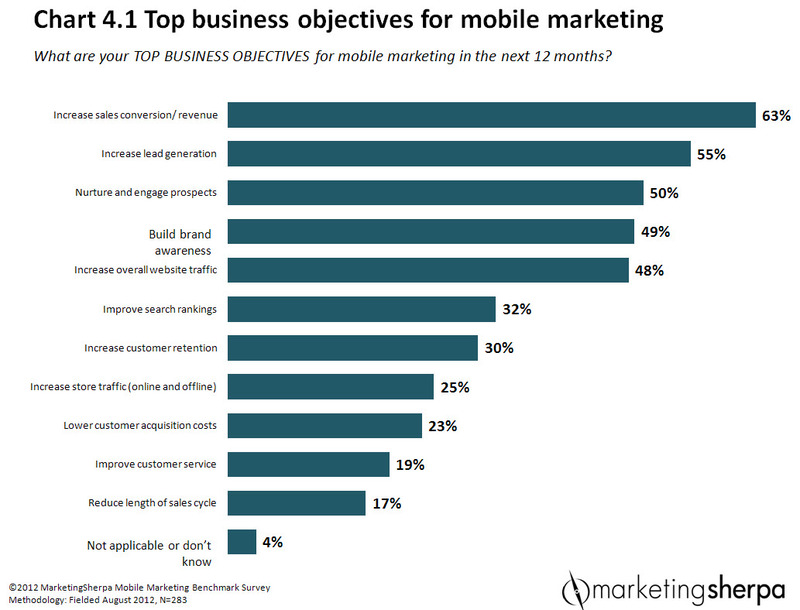 Q: What are your TOP BUSINESS OBJECTIVES for mobile marketing in the next 12 months? Q. 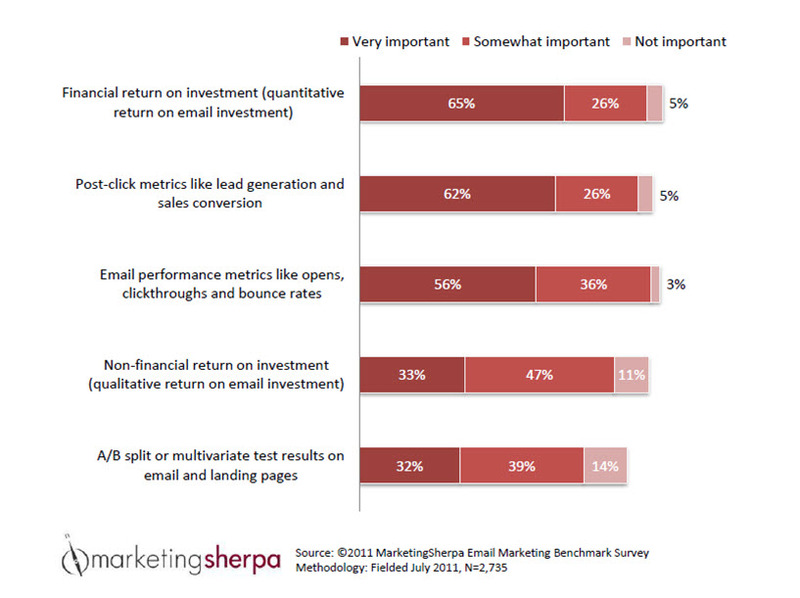 As CMO or the senior marketing executive in your organization, how important are the following factors in helping you determine and communicate the value of email marketing programs? 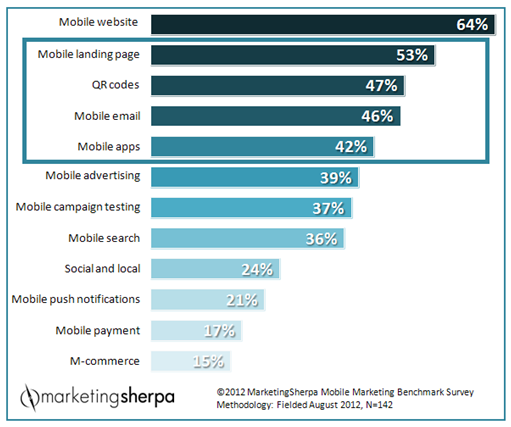 While looking through the MarketingSherpa 2012 Mobile Marketing Benchmark Report, I noticed a parallel between the top mobile tactics to be implemented within the next six months and the most recent case studies MarketingSherpa has published on mobile marketing. 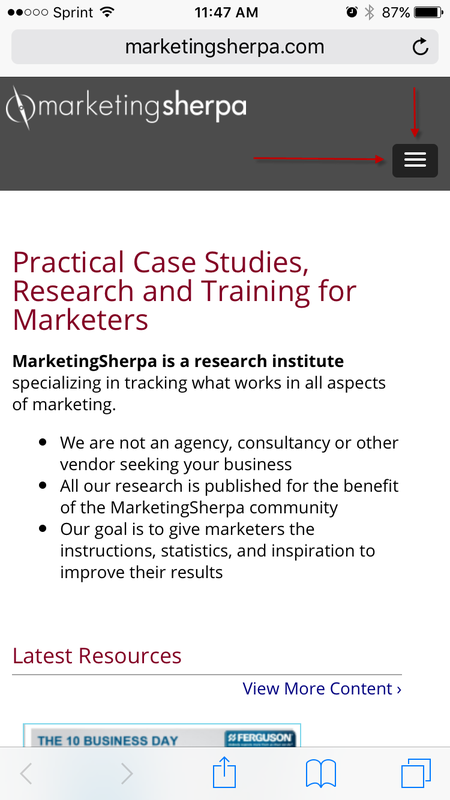 Recent MarketingSherpa case studies have focused on four of the top five tactics, even touching on the top tactic, mobile website. 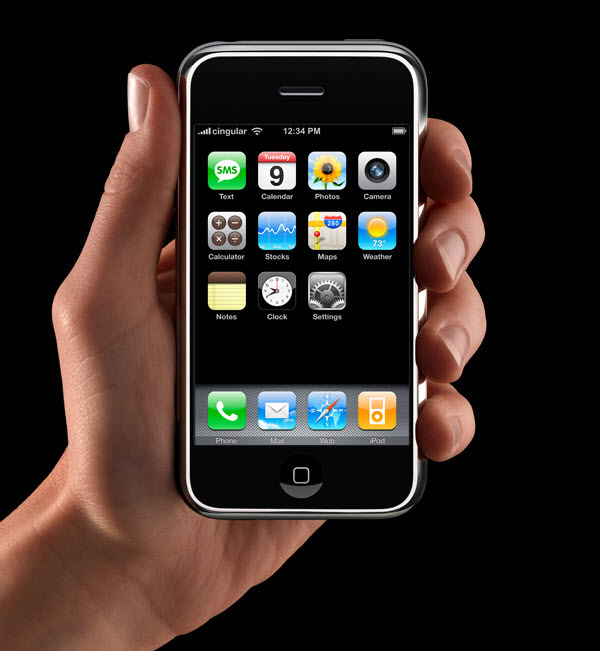 Some marketers have started the implementation process of mobile marketing, and they have already seen great results. To help you get started on these top tactics, we pulled out the key takeaways from these case studies. The MarketingSherpa Mobile Marketing Benchmark Report shows a staggering 55% of marketers reported lacking an effective mobile marketing strategy, as well as not having adequate staffing, resources and expertise. With MarketingSherpa Email Summit 2013 quickly approaching, speaker Diana Primeau, Director of Member Services, CNET – who will be presenting a session on win-back campaigns and list cleansing at the event – has insight to offer on this topic to fill in the knowledge gaps when it comes to developing an effective mobile newsletter strategy. Diana said she knows many marketers become overwhelmed when upper management demands “mobile” without understanding the time and work that goes into it. “It is not a little magic wand … because if it was really easy, every single email we look at today would work well on mobile,” she said. Knowing your audience will allow you to not only understand what their expectations of you are, but what types of devices the majority of them use, and how often they interact with your emails on their device. The MarketingSherpa Mobile Marketing Benchmark Report also shows 31% of marketers don’t know their mobile email open rate – start by determining what that rate is, and become better acquainted with the needs of your audience. Like most aspects of marketing, mobile newsletters are not something you can wash your hands of once it’s accomplished – it is a constantly evolving process where your customers will always want more. With mobile, Diana said, “Our customers are just like everybody else’s customer,” meaning every aspect of an average customer’s day from dawn to dusk is filled with multiple devices, and they expect their emails to reflect that. “They might be commuting to work and they are on their phone, and they might be sitting at their office and they might be on their desktops. They might be going to meetings and they might have their tablet with them, and they might be sitting at home and they have their tablets or … their phone with them,” she said. Knowing how your customer spends their day will help you develop your mobile email program, and decide how expansive you need to be. “Mobile is a behavior, not a technology. It’s about accessing content wherever you are. It’s really the use that is mobile, not the device,” Anna Bager, VP and GM, Interactive Advertising Bureau’s Mobile Marketing Center of Excellence, said in an interview with ClickZ. This leads to part of the challenge facing marketers. How do you optimize for this emerging behavior? 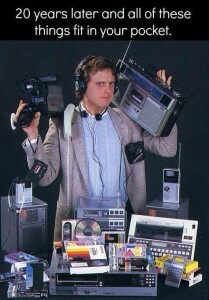 After all, technology is easier to optimize for than fickle people. If you were just optimizing for technology, you could simply, or not so simply, make sure something reads well on mobile. 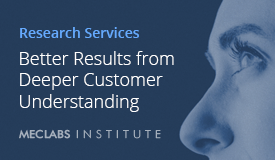 In today’s MarketingSherpa blog post, we’ll give you an abbreviated look at some data and resources compiled by the MECLABS Business Intelligence team to help you understand this new and still-evolving customer behavior. 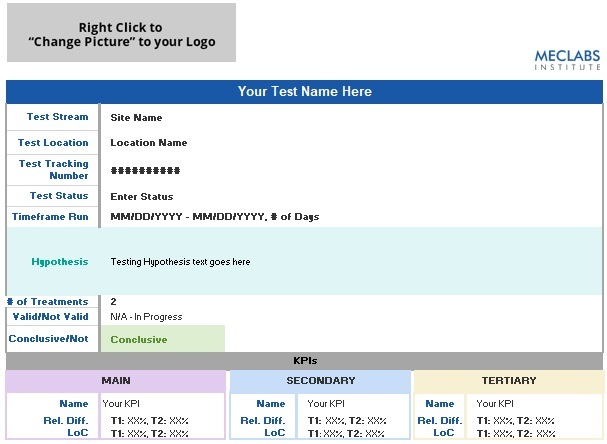 “We put together this summary to help our team get a quick snapshot of key takeaways they can incorporate now in their optimization projects. We hope this summary helps many of our readers, too,” Gaby offered. What struck me about visiting New York City a few months ago is the sea-change in behavior of office workers. You used to walk through Midtown Manhattan and see people on the street in front of office buildings taking a smoking break. Now, everyone is milling around checking their smartphones. 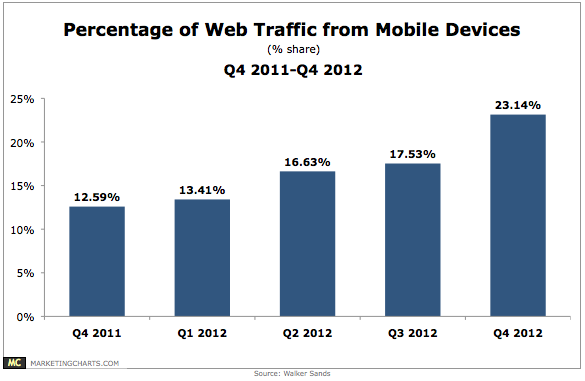 Website traffic coming from mobile devices increased 84% from Q4 2011 to Q4 2012, according to a report from Walker Sands. Nielsen also shows mobile growth but breaks it down slightly differently and looks at a slightly different timeframe – July 2011 to July 2012. Its study shows a significant difference in time spent in mobile Web versus apps. 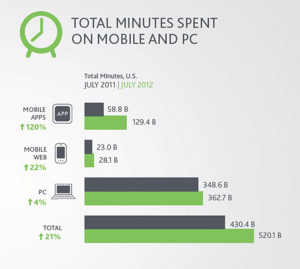 Time spent in mobile Web grew 22% while mobile apps grew by 120%. How you can use this data: First off, this data is a great proof point to secure the budget necessary to reach mobile customers.